Maj Michael Willis worked to make sure that the competition ran smoothly over the weekend. He had help from 4 Senior Members and C/1st Lt Blaise Thibodeaux as Cadet Commander overseeing 9 cadet staff. The cadet competition was pleased to have the NC Wing Vice Commander, Maj Ed Angelovich, attend the awards ceremony to present the trophies to the winning individuals and teams. 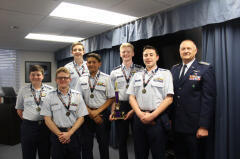 Both the 111th Search and Rescue Squadron and the Boone Composite Squadron are working diligently to represent the NC Wing at the MER Cadet Competition at the end of March. Congratulations to all the individuals and teams who participated in this year’s competition!